And while the CNN poll is a bit of an outlier, the Democratic advantage in the FiveThirtyEight generic ballot aggregate is up to about 12 points, 49.6 percent to 37.4 percent. That average, like the CNN poll, also shows Republicans in worse shape right now than any other majority party at this point in the midterm cycle1 since at least the 1938 election. No polls were available for the 1942 cycle. *No November or December polls were available in these cycles. Instead, the final poll from October in the year before the midterm is used. So Democrats are up a lot. A lot a lot. But how might a lead this big manifest itself in 2018? First, Democrats are probably favorites to win the House. Their current advantage is larger than the lead Republicans had at this point in the 1994 cycle, the lead Democrats held at this point in the 2006 cycle or the lead Republicans had at this point in the 2010 cycle. Those were all years when the minority party won control of the House. And a 12 percentage point Democratic advantage in the national House vote come next November would likely be more than enough for the House to flip again. I’ve previously calculated that the Democrats need to win the national House vote by 5.5 to 8 points to win the House. You can see in the chart below just how many Republican seats could potentially be in danger given the current climate. Let’s say only Republicans in seats with a partisan lean2 of more than 12 points in favor of Republicans are truly safe. (The idea being that Republicans would need that size of a cushion to withstand the Democrats’ 12-point edge on the generic congressional ballot.) For fun, let’s also look at how many seats have a Republican lean of less than or equal to +18 percentage points (as the CNN poll suggests are in play). Keep in mind that Democrats need to win 24 Republican-held seats to gain control of the House, assuming that Democrats don’t lose any of their own seats. There are 58 Republicans in seats with a partisan lean of +12 points Republican or less. This includes representatives like House Speaker Paul Ryan and Dave Brat (who took out Eric Cantor in 2014). There are an astronomical 103 seats that have a partisan lean of +18 Republican or less. This expanded list includes the highest-ranking woman in the House, Cathy McMorris Rodgers, and the longest-serving House member, Don Young. Now, I’m not saying all or any of these particular Republicans will lose. Most incumbents win — even in wave elections. Indeed, incumbents tend to do better than the partisan lean of the district would suggest, though that effect has been getting smaller and is usually lessened in waves. We’re still nearly a year away from the midterm elections, however. And voter preferences at this point can change dramatically by election day; the average difference between the congressional ballot at this point and the final result is about 9 percentage points. But most large shifts on the generic ballot from this point onward have occurred against the party that holds the White House.4 Once you take into account who holds the White House, the generic ballot at this point is usually predictive of the midterm House result. Indeed, so far this year, Democrats have more than doubled their April generic ballot lead of 5 percentage points. The Democrats led by just 6.9 points when they lost the Georgia 6 special election. That indicates that the normal midterm trends are holding even in the age of President Trump. 63 percent of voters told Quinnipiac University that the economy is good or excellent. That’s a record high since Quinnipiac first asked that question in 2001. Most Americans, 73 percent, believe the world will be a less peaceful place in 2018, per Quinnipiac. A majority of Americans, 60 percent, say Trump’s election to the presidency has made race relations in America worse, according to the Pew Research Center. Only 13 percent felt that way about Obama’s election at this point in his term. The latest NBC/Wall Street Journal poll finds that 52 percent of Americans say they will “probably” or “definitely” vote for the Democratic candidate in the 2020 presidential election. Bill Clinton’s unfavorable rating is up to 52 percent in Gallup polling. That’s the highest it’s been since 2001. Hillary Clinton’s unfavorable rating has climbed to 61 percent, which is the worst Gallup has ever recorded for her. Democrat Phil Bredesen leads Republican Marsha Blackburn 42 percent to 40 percent in a Gravis Marketing poll of this potential 2018 Senate race in Tennessee. 72 percent of Americans told Gallup that the U.S. health care system is in crisis or has major problems. That’s nearly equal to the 71 percent who felt that way in 2009, just before the Affordable Care Act was passed. Sen. John McCain holds a 54 percent favorable rating among all Americans in the latest CNN survey. His favorable rating among Republicans is slightly lower at 46 percent. Only 50 percent of Americans with Hispanic ancestry who have been in the U.S. for four generations or more identified themselves as Hispanic, according to the Pew Research Center. That compares with 97 percent of foreign born adults with Hispanic ancestry who say they are Hispanic. Just 19 percent of Americans said that “Die Hard” is a Christmas movie in a YouGov poll; 56 percent think it is not a Christmas movie. After hitting an all-time low last week, Trump’s job approval rating stabilized at 37 percent, with a disapproval rating of 57.2 percent. 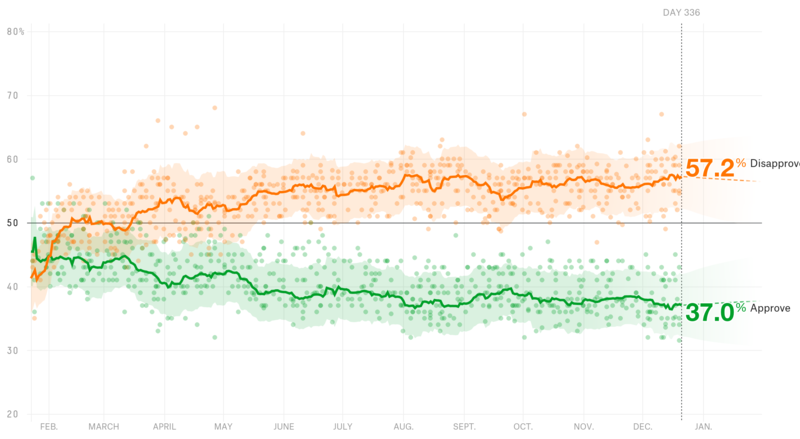 Two weeks ago, Trump’s approval rating was 37.3 percent, and his disapproval rating was 56.4 percent. All years are an average of November and December polls except for 1974, 1978 and 1986, which are simply the final poll taken in October of the year before the midterm election. No data was available for the 1942 cycle. To calculate partisan lean: We took a weighted average of the difference between the national results in the last two presidential elections and the results in a given state or district, with the 2016 election weighted 75 percent and the 2012 election weighted 25 percent. See the first footnote here for more detail on this. If Democrats were able to win 64 percent of the 58 currently Republican held seats with a partisan lean of +12 Republican or less, they would take 37 Republican-held seats in the 2018 election, more than enough to win the House. The only time the White House party gained more than 4 percentage points from now until the midterm was in 1974. That shift can probably can best be described as a regression to the mean, given that the Democrats held a 32 percentage point lead at this point in the cycle. In 1974, Democrats would still go on to win the largest margin in the national House vote in any midterm since 1938.